Yamaha is proud to celebrate a momentous landmark in its successful motorcycle racing history, having secured its 500th race win at the Le Mans Bugatti Grand Prix race circuit in France. The Yamaha Factory Racing Team is known as one of the most successful teams in Grand Prix racing and it has further underlined its reputation today. Maverick Viñales rode a brilliant race at the Le Mans Bugatti Grand Prix race circuit in France, and sealed the 500th Grand Prix win for Yamaha. 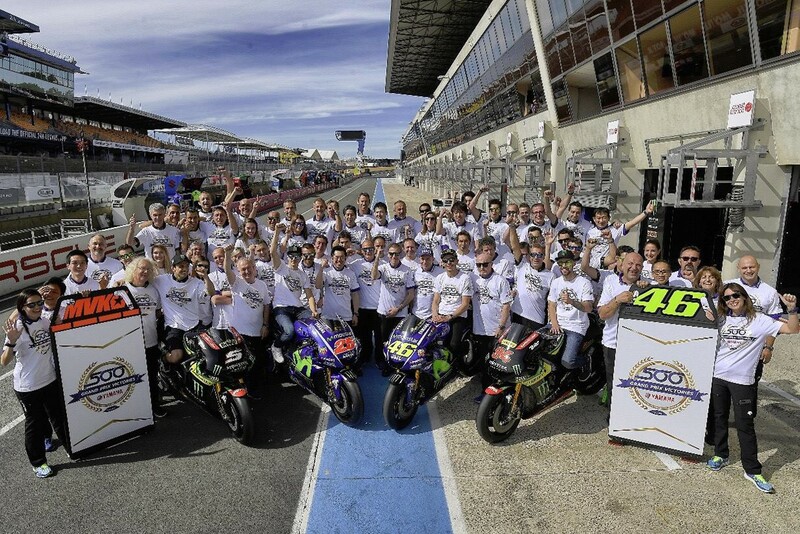 The Fédération Internationale de Motocyclisme (FIM, the global governing body of motorcycle racing) has officially declared that, according to their statistical records, Yamaha has enjoyed victories in the 125cc (47 wins), 250cc (165 wins), 350cc (63 wins), 500cc (120 wins) and MotoGP class (105 wins), adding up to a sensational 500 Grand Prix wins in total. Out of all Yamaha riders, current MotoGP class racer Valentino Rossi is the biggest achiever. His love story with the YZR-M1 has been going strong for many years and has resulted in 55 wins to date. Teammate Viñales has only been competing as part of the Movistar Yamaha MotoGP Team for five races, but has established an impressive 60% victory rate on the Yamaha, thanks to his wins in Qatar, Argentina and France. Other Grand Prix racing stars on Yamaha‘s list of victors are Jorge Lorenzo (44 wins), Phil Read (39 wins), Eddie Lawson (26 wins), Wayne Rainey (24 wins), Kenny Roberts Sr. (24 wins), Bill Ivy (21 wins), Carlos Lavado (19 wins), Luca Cadalora (13 wins), Giacomo Agostini (12 wins) and many more. To give an overview of the magnitude of the effort put in by all its Grand Prix riders, Yamaha has created a micro website, which features a special 500th victory video, an infograph, some of the best historical photographs of Yamaha‘s 56-year Grand Prix racing run, as well as overviews of all the victories, riders and bikes that made this massive achievement possible. To create an overview of the magnitude of effort put in by all its Grand Prix riders, Yamaha has created a micro website (www.yamahamotogp.com/500-victories), which features a special 500th victory video, an infograph, some of the best historical photographs of Yamaha’s 56-year Grand Prix racing run, as well as overviews of all the victories, riders and bikes that made this massive achievement possible. General Manager Motorsports Division & Yamaha Motor Co., Ltd.
* Kando is a Japanese word for the simultaneous feelings of deep satisfaction and intense excitement that we experience when we encounter something of exceptional value.